a book chick: "Lincoln in the Bardo"
Legend has it that after President Lincoln's son Willie died, he went to the cemetery and took the boy's body out of the casket to hold one last time. This myth/event is the impetus for this graveyard tale. 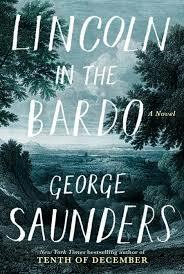 The inhabitants of the bardo are those who seem to be keeping themselves in a state of purgatory, in the liminal space between life and what comes next. They are shocked and awed that Mr. Lincoln does what no one has done and this sets the entire crazy ghoulish community atwitter. At time hilarious and at times utterly moving, I loved this conversation of the deceased and the journal/letter entries of Mr. Lincoln's contemporaries. After Team of Rivals I adored the 16th President; after this, well, I feel I've walked a mile in his shoes. I also wonder if Mr. Saunders has read C.S. Lewis' The Great Divorce. Daughter Anne reports that the audio version is a production, nearly a radio play, with all different voices: Author Saunders takes a role with 165 others joining him. The book is a bit confusing at first, so the audio definitely will be to start. And very worthwhile. I think this would make an amazing movie. my source: Stephen Colbert interviewing George Saunders, my interest in Mr. Saunders having grown since I saw him at the Festival of Faith and writing last year. Loaned from bookie Bea - whose hubby gave her a book a month for Christmas (!) from their local St. Joseph, MI bookstore; she gets an email with suggestions and then saunters down there and makes her pick. I may have encouraged this one. In February I sauntered and picked a Saunders. Indeed, it was confusing at first, and I found that reading in longer stretches made it more understandable and cohesive. It's quirky and thought-provoking and oh so entertaining. This month my saunter will likely involve the pick up of NEWS OF THE WORLD by Paulette Jiles. You can read it after me, Lee.